A lot has continued to change since we last chatted about documentation. CMS released new/revised information regarding JIMMO but perhaps more importantly recent audit findings on Therapy documentation by CMS adjudicators have defined how auditors will review therapy documentation – Medical Necessity. Therapists have requested a “How to” on defensible documentation. In response to the changes and the therapist requests, we have completely revised our Transform Your Documentation Webinar Series. 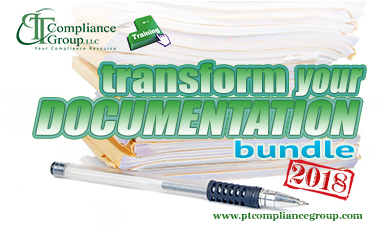 Make sure you are prepared for how your documentation will be judged. The series takes a Three part approach to enhance your documentation and potentially decrease denials based on medical necessity. The primary objective is to guide therapists in writing defensible documentation in an increasingly scrutinized environment. As always participants will receive a recording of each of the three webinars in the series as well as PDF of slides.